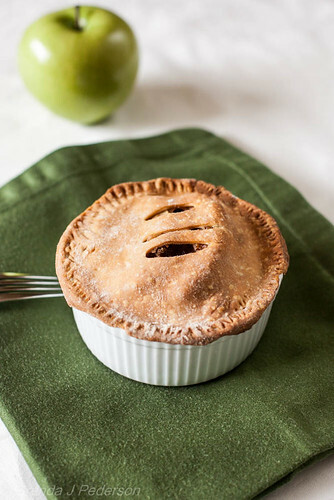 I love apple pie – or any type of pie, really – but don’t like the idea of eating an entire pie on my own. So I normally only make them when I’m entertaining or can take one to a family event or potluck with friends. One way I’ve solved this “problem” is by making small, rustic tarts instead of pies. But I thought of another solution a couple of weeks ago and it’s one of those things that I can’t believe I didn’t think of years ago! Every year I make small, savory pot pies in the cool months, especially right after Thanksgiving when I have leftover turkey. It occurred to me that I could use this same idea for fruit pies, too. And so I did. And it worked great! Although you can both line and top the ramekins with pie dough I prefer to only top them with dough. This makes me feel a little less guilty about indulging. If you plan on doing this you’ll need to figure out exactly what works for you based on what size ramekin you’re using. The one in the photo is about 4″ across and about 2″ deep. It takes one large apple, sliced, to fill it. I mix the slices with sugar, flour and cinnamon just like you would any apple pie. You’ll want to place the slices in the ramekin, to really pack them in and slightly heap them in the center. Once you have filled the ramekins, roll out and cut the pie dough. Use one of the ramekins as a guide and cut the dough just slightly larger than it. Make steam vents in the dough and place evenly over the filled ramekin. Use a fork to press the dough to the rim of the ramekin, so that the dough will not shrink up as it cooks. A single pie crust will make about 6 toppers for this size dish. Wrap each ramekin first in plastic and then in foil. Freeze until ready to use. When you want to bake the “pot pie”, preheat the oven to 425°F. Place the pot pie in the oven and bake for 15 minutes. Then, turn down the oven to 375°F and bake for an additional 45 minutes. The top will be golden and the filling should be bubbling and steaming. Carefully remove from the oven and allow to cool, at least slightly, before eating.